We have blown another bulb in one of our outside light fixtures. When doing our PDI at the dealer, a outside bulb was blown, they replaced it, now we have only had our RW for 3 months now and another one is blown. 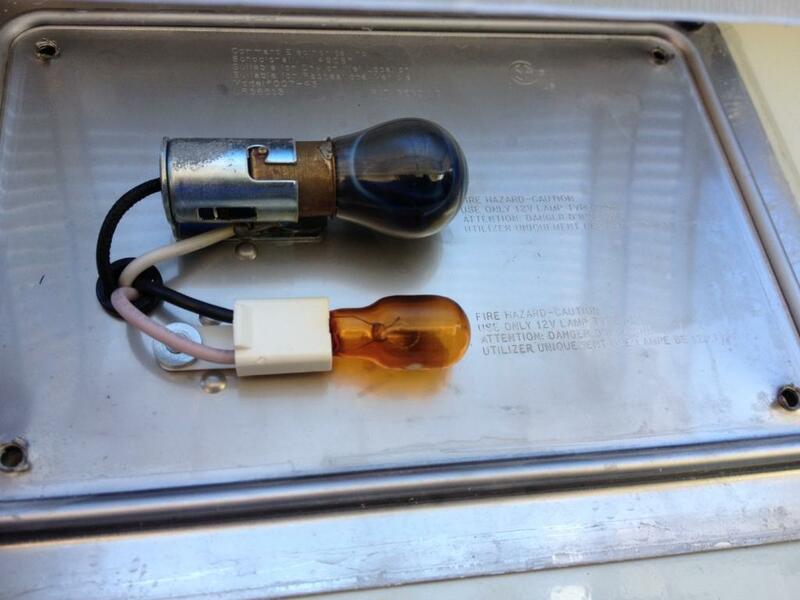 Does anybody know what the part numbers of the yellow and white bulbs that are in the outside light fixture? Also is there an LED bulb that will fit these fixtures? The outside porch and scare lights are standard 1156 type auto lamps, porch is amber, scare is white/clear. Both scare lights are the same type bulb. Removing the cover for the front scare light is easy, simply remover the screws and the cover comes off. Make sure to get the rubber gasket lined up correctly when reinstalling to about water contamination. The cover over the door is another story, there are screws securing it but it is also sealed with silicone which you will need to CAREFULLY cut through to remover the cover [no rubber gasket]. I've replacer all mine with LED's, the white/clear ones are easy to find but the amber LED is more difficult. I purchased mine from SuperBrightLED, they have both the clear and amber [also have yellow and red]. This is the LED I used, they are not inexpensive but you should never have to replace them again. Thanks for the info, had not though about sourcing the yellow and white light in a LED bulb. I guess the lens are a PITA to get off, I saw the dealer tech change the yellow bulb at PDI and he was having a hard time getting the lens off and then had to seal it back on. What happened to easy to change bulbs, why does it have to be so difficult? I replaced all mine with LEDs as they were slowing going out. The lenses are siliconed to the RV so have a razor blade or something to cut the silicone ready along with a tube of silicone. All told it probably took me about an hour to change and reveal everything. The hardest part really is finding the bulbs, in particular the Amber bulbs as others have mentioned. I'm not sure why Redwood felt these needed to be sealed, other than due diligence maybe. That was my thinking as well. I could see sealing the base and thus the hole into the RV, but the lens just needs a rubber gasket. No different from an auto taillight really. Oh well, I sealed mine up nice and tight. Now I need to rework some of the other silicone that all over the trim on the slides now. It's starting to shrink badly. Went to Wal-Mart and they had a two pack of 1156 LEDs for about $15 so I bought them since we are on the road moving every week or two and really need the white porch light. Will have to see about getting the yellow light in a LED, notice it is not the same type of bulb as the white light. 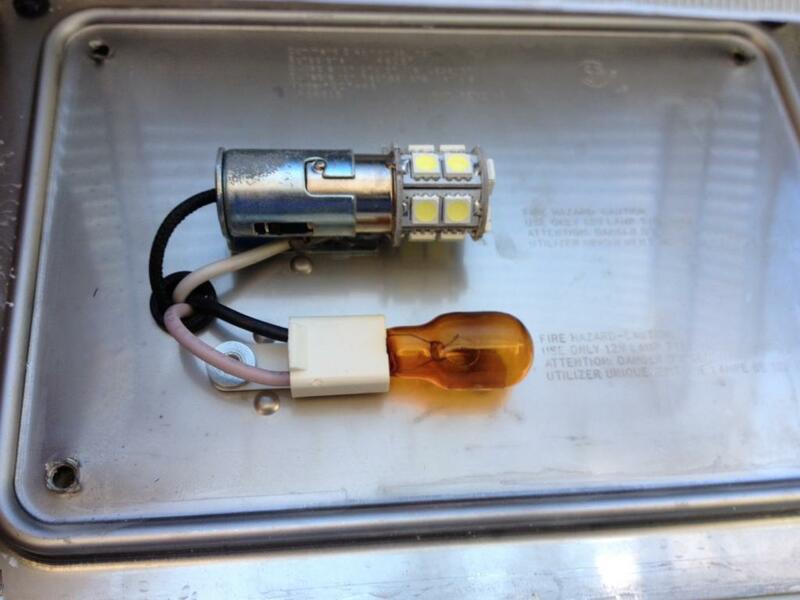 I purchased white LEDs from Ocean Grove RV in St Augustine. The LEDs are much brighter than original bulbs. Have not replaced amber lights with LEDs and need to as both of them are not working. I did fix the issue of "gluing" the lens cover to the coach, I "glued" gasket material (carefully cut to fit) to the fixture backing then juse screwed the lens cover on, been on for 8 months and have not had an issue.